A VINCULO MATRIMONII - Lat. 'from the bond of marriage'. 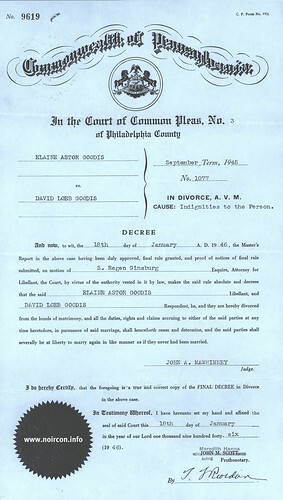 A marriage may be dissolved a vinculo, in many states, as in Pennsylvania, on the ground of canonical disabilities before marriage, as that one of the parties was legally married to a person who was then living; impotence, and the like adultery cruelty and malicious desertion for two years or more. 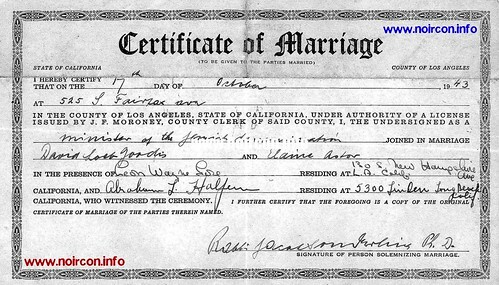 I hereby certify that on the 7th day of October, 1943 at 525 S. Fairfax Avenue in the county of Los Angeles, State of California,Under the Authority of a license issued by J. P. Moroney, County Clerk of Said County, I, the Undersigned as a Minister of the Jewish Denomination joined in marriage David Loeb Goodis and Elaine Astor in the presence of Leon Wayne Lore, residing at 130 S. New Hampshire Avenue, L.A. Calif., and Abraham Louis Halpern, residing at 5300 Linden, Long Beach, Calif. who witnessed the ceremony. Of note, Abraham Louis Halpern was David Goodis's uncle. He was the brother of Molly Halpern Goodis. In addition, the building was used in the Shul scene for the movie "The Jazz Singer" in 1927.